After receiving a nice email from Marcus of marcusmotodesign in Sweden I got motivated to finally finish a KTM 690 street tracker Bikenstein which had been sitting half finished for ages on my computer. true, none of the KTM’s have 19’s except the adventure on the back though so tricky to find high res photos. Its got MX bars as well so its kind of a hybrid I guess. You’re right, my mistake. It’s even called hybrid… And its cool one! Wet tyres are a good solution for 17inch trackers. and marcus for the motivation! Where does the tank comes from. Ok but where can I get any similar one? Try and ask ron wood at that link, he should know. Desperately pathetic, if you actually had skill worth showing in public you’d build one of these. Haha. Skills, time and money. It’s just an idea. A concept. Most ideas start on paper or the screen, at least if you have those skills. So in this day an age your comment looks desperately ignorant. Dear ptsp or whoever you are if this was an original idea or concept i would applaud it. Turning an original idea into an image or drawing does take skill. This however is just a mishmash of images already found on the net and is as original as bread and displays no imagination whatsoever.This is the level of a twelve year old. If Piers? is twelve, well done. I suspect however that he is`nt and is merely attempting to have his ego massaged by sicophantic people such as yourself. If that makes me ignorant then great! Well spotted, It is indeed a mishmash of images (and a few other things drawn in to tie it together) hence why this and other bikes in this category are called ‘Bikensteins’ ;) I make no claim on it being original, it is just a bike I would like. No idea under the sun is original, everything is a re-interpretation of something else, particularly when it comes to street trackers. 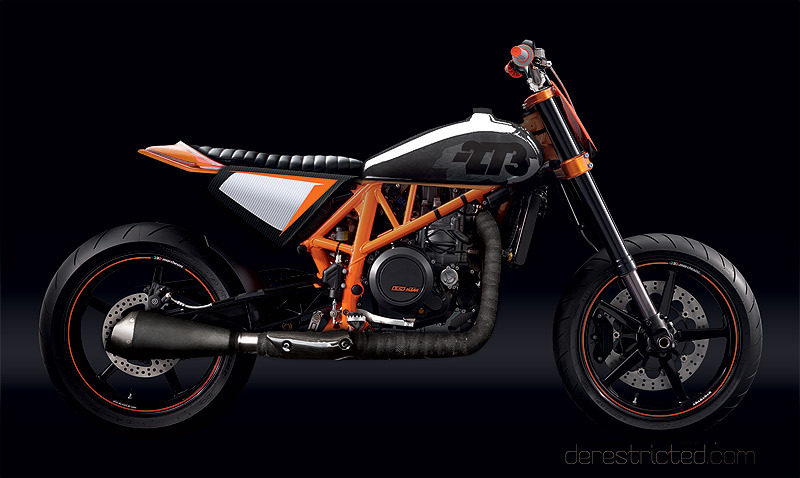 If you are looking for a more original idea, perhaps you will like this one more: http://blog.derestricted.com/design/ktm-street-tracker-concept/ although it also borrows from other bikes, so maybe is also not up to your standards. Would you like to share one of your concepts so we can see how it should be done? Dear Admin, the bikes and engines i build are mostly intended for the track and as such any original ideas feature in the technical side rather than cosmetically.Bikes that i have built have been featured in a number of uk magazines including Tbm, SuperMoto, MCN and others. Personally i find if the customer is happy then that is satisfaction enough. I don`t care if others don`t like it especially since i find that most critics have never made anything in their life. I design my own bodywork and graphics when necessary as well as engine and chassis parts but i don`t publish these designs, you have to pay. I`m not interested in going on the web to tell everyone how good i am my ego isn`t that fragile. Sounds good man. Shame you don’t have a website to show what marsh performance does. A website is not just for the ego, it’s good for news, networking, using as a portfolio, sales tool, marketing, good photos, education or generally just getting people stoked. I use it for most of those things and in general people appreciate the time I put into it and what i post. I would build this bike if I had time and money, but I dont have enough of either. Not really any need for aggressive judgmental comments from you, but I put it out there so it’s fair enough I guess. When not working fulltime, I get in the garage to work on my 150sx and most the other free time when I get a break from being a husband or dad is spent riding it. If your really into bike design then you`ll know of Oberdan Bezzi. If not you should check him out, his stuff is all drawn from scratch (though clearly plageristic in parts) and demonstrates some interesting ideas even if they`re not all my cup of tea. As for me, a, i never said a website is for the ego, its all about the content and why its posted. b, “aggressive” and “judgmental”, all the comments expressing a view about whats being posted are being judgmental even if they`re in agreement. Am i aggressive just being i`m not bigging you up? Is effing outstanding any less aggressive or just positive? If you only want to hear how great you are then stick to showing this stuff to your friends. As for owning a 150sx, good choice, awesome little bike, i`d recommend replacing the alloy plates in your clutch pack with steels, they wear better and act like a flywheel weight. Also keep an eye on the spacer behind the sprocket, they wear badly and cause oil leaks. Thanks for the 150 tips. I am working on the GFX for the 2014 model SX’s today, and they are looking pretty good so far. Well, that was an enlightening bit of ironic trolling double-talk. `ironic trolling double-talk`? Sorry but thats over my head! thank you for your computer works !